Emails generally serve most of the purpose for sending useful and detailed information through the internet. But for urgent and quick announcements and updates, there is nothing faster and easier mode of sending information than SMSs. In this era of mobile technology, since everyone has got cell phones, it becomes easier to send alerts through automated messaging system. You don’t need a standalone software just for sending SMSs. 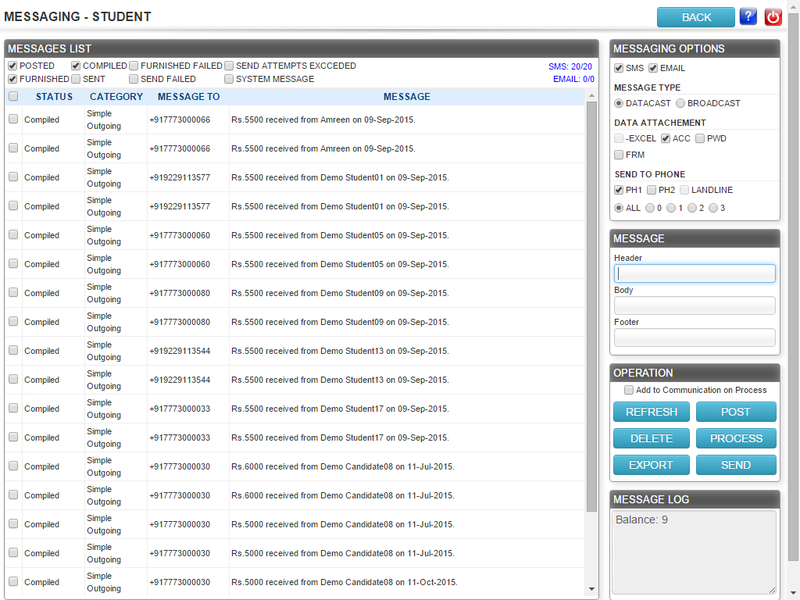 ECAS as an campus automation system has an inbuilt SMS facility along with the Email module which does the message sending tasks with no extra cost. What does SMS Module in ECAS Provide? You can send bulk messages in a single click to any number of students in groups course-wise, department-wise, batch-wise, etc. You can also send individual messages to a particular candidate specific to its status. Along with students, parents and guardians can also be informed and kept up-to-date. The best and the most useful feature available in ECAS is the Auto SMS facility integrated with each module of the software. It works as a very efficient school automation software by sending out auto generated message templates for welcome SMS, enrolment, username & password in enquiry and follow-up modules. Information regarding tests and online results can be updated to students from the examination panel of the software interface. Using this software for library management system, availability of books can be updated to students through SMS. Apart from this auto generated SMS templates, custom messages can be drafted and sent to a particular student or group of students. It also has a function of sending transactional SMS with sender ID (e.g.TD-ADDMEN) to confirm the authenticity of message. Client has the flexibility of choosing their own 6-digit sender ID for sending such transactional messages. SMS and Email module are integrated together in the same panel to save time while sending messages. In the SMS panel, you get all details of the SMS status like message furnished, send failed, sent, send attempts exceeded, etc. You can choose home, office, alternate mobile no or all at once to send SMS. ECAS keeps a record of all the SMS logs in the database which can be obtained in Excel and printed from PDF format by the concerned departments. All these different facilities of SMS in just one application module makes ECAS the most versatile institute management software keeping the institute and students up-to-date.